Continue building your ONE+ range with this classic and powerful all-rounder. The RYOBI 18V ONE+ impact driver is powerful yet convenient enough to become your most often used tool. The powerful motor generates 180Nm of torque. This power is enough to produce spin speeds of up to 2,600rpm, and an impact rate of 3,200 impacts per minute. Staying in control of fiddly tasks couldn’t be easier. The RYOBI ONE+ impact driver comes complete with a sensitive trigger and the ability to brake. So no matter whether you’re going forwards or backwards, you’ll always have the upper hand. The unit comes encased in tough die-cast front gear housing to prolong the life of the driver. 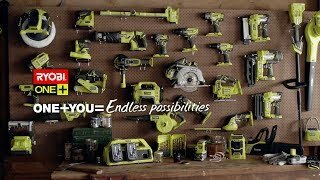 With the right power, control and toughness, the RYOBI ONE+ impact driver is the ultimate addition to any toolbox. Get your RYOBI 18V ONE+ impact driver from your local Bunnings Warehouse today.